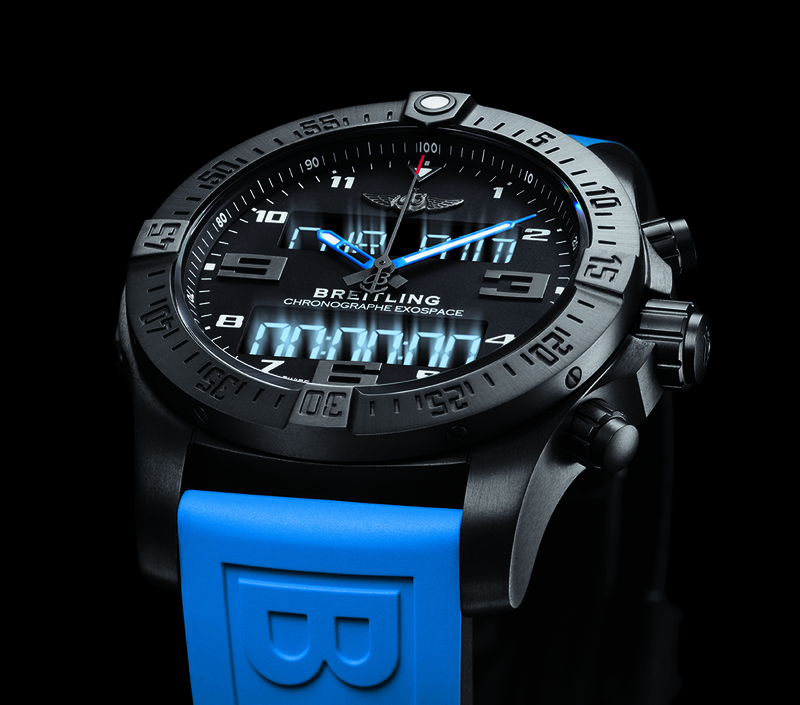 Breitling joins the smart/connected watch genre with their Exospace B55. We were not at the release event (New York, Dec 16), and have not yet had a hands-on with the watch. But as we read the press release, and began our analysis and comparisons vis a vis other smart/connected watches, we begin to realize that it does so with a new approach. 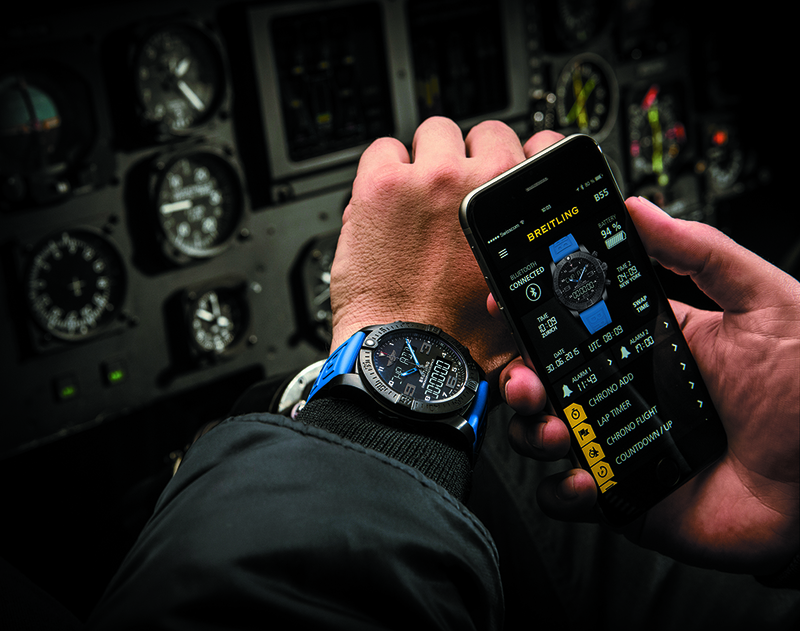 The Breitling Exospace B55 is not a passive partner to the smartphone, but taps on the strengths to enhance the watch’s functionality and user-friendliness. Breitling Exospace B55 watch. 46mm case diameter, black titanium case with rotating bezel. A quartz chronograph unlike any other. Breitling has always been using electronics where it makes sense to enhance their watches. The SuperQuartz™ movement used in B50 Cockpit is an example. The B50 Cockpit uses a special thermocompensated quartz electronic movement, which promises to be 10 times more accurate than regular quartz movements. A thermocompensated quartz movement is one which takes into account the effects of temperature over the quartz oscillation. ETA produces the ETA 251.232 movements which are certified by ETA as accurate to 10s per annum. Breitling documentation states the movement is their B50, which they claim to be a manufacture movement. While we are not able to verify if indeed they are designed and produced in a Breitling factory, we can confirm for certain these are based on the ETA, and as far as we know exclusive to Breitling. Connection of the Expospace B55 is more than the typical smart/connected watch. A true two way communication is established between watch and smart phone, and settings, information and data can be passed bidirectionally between the devices. The Breitling Exospace B55 takes this one step further. The core is the B50 Cockpit, but with the added convenience of being connected to a smartphone. The Exospace B55’s connection to the smartphone is not only about being able to prompt you on notifications of the smartphone’s incoming emails, messages (SMS, WhatsApp) or phone calls (with caller’s name or number) as well as reminders of upcoming appointments. It does that, but the relationship between phone and watch is much deeper. Read this: for our earlier musings on the Smart/Connected Watch genre. For the B55, watch and phone communicate with each other via Bluetooth, sharing data.The phone is superior to the watch as it has better ergonomic interface, and a larger screen. And watch is superior to the phone as it is wearable, conveniently strapped to the wrist. It also is has superior ergonomics in many of the standard watch functions like telling the time, second timezone, and chronograph functions. 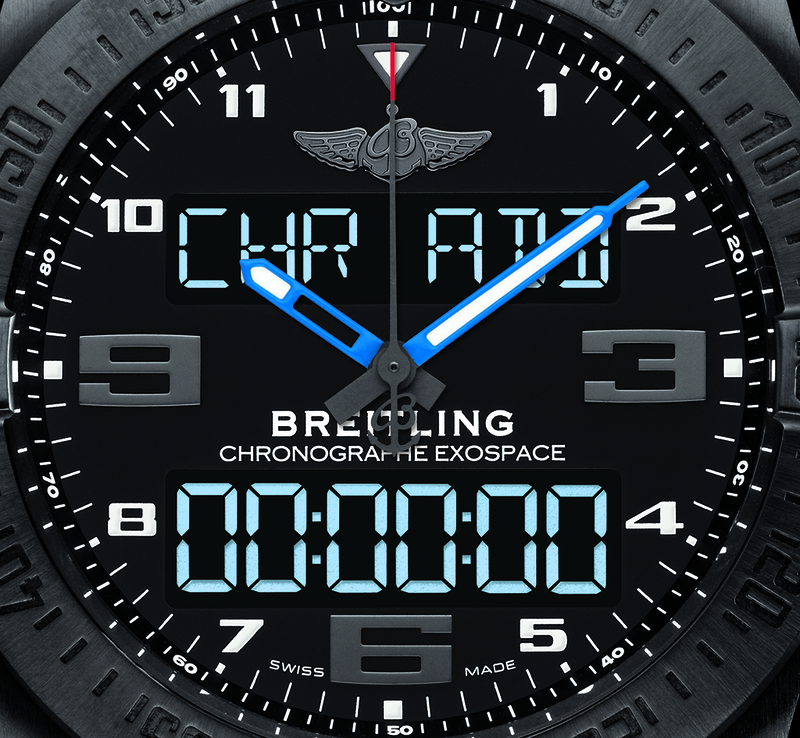 To capitalize on each of these devices strengths, the Breitling B55 Connected app on the phone serves as a kind of remote control for the watch, allowing quick updates to the functions and adjust settings like time-setting, timezones, alarms, display and operating parameters, night mode. But that is not all. The user can also upload watch data like chronograph measurements of flight times, split times, lap times, ect. to the phone. Easier to read with the larger real estate of the phone’s screen, but also to store and pass the data on via email, or connected via other applications in the phone’s database and beyond. The Breitling Exospace B55 is a rather handsome watch, in the conventional sense. The case design is very pleasing, and the dial layout very legible and sensible. record “block times” (times elapsed from the moment the plane begins to taxi towards takeoff through to when it comes to a halt at the end of a mission) and flight times, while memorizing departure dates and times, arrival times, as well as takeoff and landing times (Block and Flight Times functions). User-friendliness is enhanced by a particularly simple and logical control mode, involving function selection by rotating the crown, and activation/deactivation by means of two push pieces. The dial layout is very characteristic of flight instruments found in an aviator’s cockpit. The two legible LCD (liquid crystal display) screens feature a back lighting system that may be activated merely by pressing the crown – or when the user tilts his wrist at a more than 35° angle (Tilt function) – that proves particularly effective when the hand is gripping aircraft controls or a steering wheel. The Breitling Exospace B55 is a very interesting watch, and a novel entry in the genre of wearable devices competing for wrist real estate. Unlike most watches in this genre, autonomy is not measured in hours, but the claimed autonomy is 2 months using a user rechargable system. Recommended retail price is S$11,950 and we have secured an appointment with Breitling to do a full hands-on when the watch arrives in Singapore for the Singapore Airshow in February 2016. 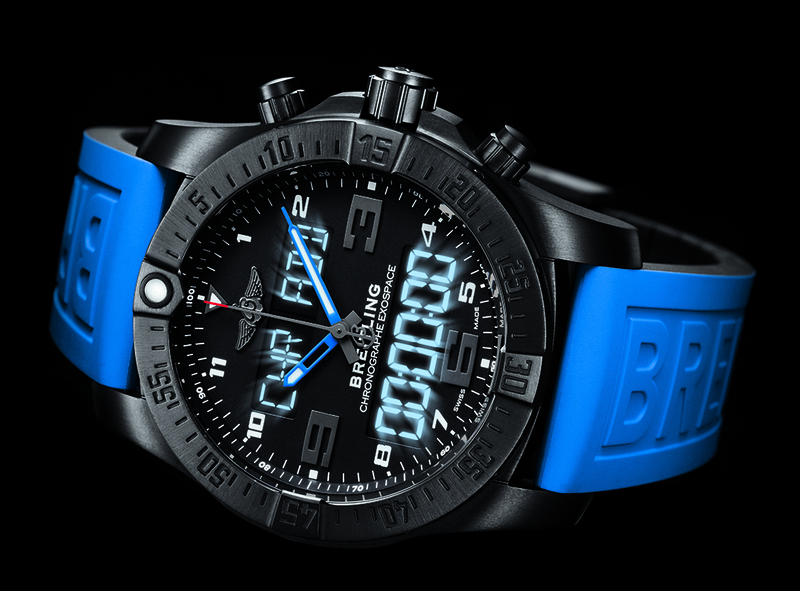 We leave you with the Breitling Expspace B55 promotional video for your viewing.